The skeletons that Jamie and Claire discover in a cave in France, with their arms locked about one another. I was stunned to discover that there really was such a Neolithic couple, discovered in a cave in Italy in 2007 -- a full fifteen years after DRAGONFLY was published! I think the picture below is just amazing. The clan stones at Culloden, weathered by more than two centuries of exposure to the elements, but otherwise unchanging. Claire's description of the way a child's personality is fixed at a very early age. 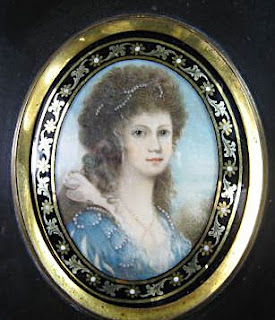 The stillborn baby, Faith, who will always remain exactly as she was when Claire saw her. 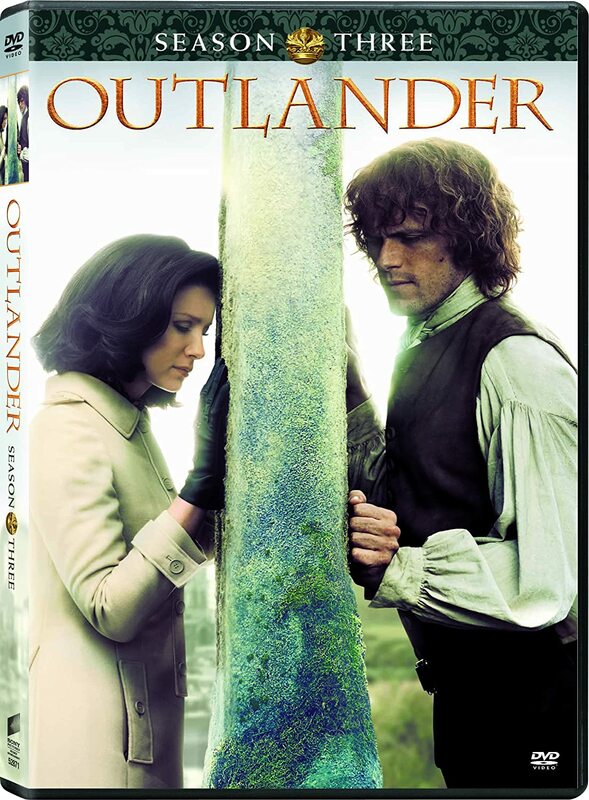 And finally, heartbreakingly...the twenty-year separation that left Claire and Jamie "frozen" in each other's memories, not dead, but trapped in time, unchanging through all their years apart. Browsing around on Amazon this morning, I discovered something unexpected. The mass-market paperback (that's the small size) edition of AN ECHO IN THE BONE will be published on May 24, 2011. You can pre-order from Amazon here, or by clicking on the picture below. 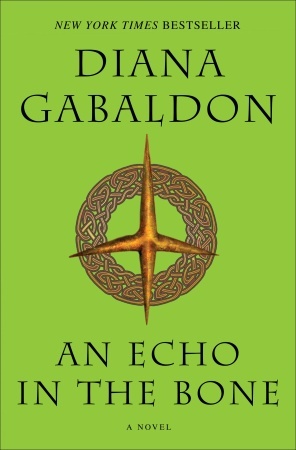 I think it's interesting that the cover is showing a very much "toned down" version of the trade-paperback edition of ECHO (shown below), the one that Diana refers to jokingly as "the Green Slime". Personally, I have always hated that fluorescent lime-green color on the trade-paperback, so if they are toning it down on purpose, I think that's a good thing. The "Green Slime" may be good for visibility on bookstore shelves (and I admit that I once spotted the book from 30 feet away, in a small independent bookstore, just by the color alone! ), but I think it's a hideous color, myself. If we can't have the very classy and elegant gold-on-black of the hardcover edition (which I thought was a terrific cover! ), then I think the more subdued pale green of the mass-market paperback is a good idea. I have no idea if the mass-market paperback will include excerpts from Book 8, or LORD JOHN AND THE SCOTTISH PRISONER. If I find out the answer to that question, I'll post it here. I noticed this morning that a great many responses from the January poll seem to have disappeared. I could have sworn that there were far more than 111 votes showing yesterday! I think this is probably a Blogger issue, not something I have any control over. There's still time to cast your vote in this month's poll, if you haven't already. It will be open until midnight Pacific time on Monday, January 31. If you think you've already voted, can you please check to see if the poll will let you vote again? Sorry for the inconvenience. If you have any suggestions for future poll topics, please let me know. I think it's interesting to see all the various ways that people have found this blog. Many of you have come here because you saw the link on Compuserve, or on Diana's new web site, or on another OUTLANDER fan-site. Some of you follow me on Facebook, Twitter, or various RSS feeds. But I also get a fair number of hits every day from people using Google and other search engines. This morning I happened to be looking at the site that tracks usage statistics for my blog, and I noticed that someone had visited (briefly) as a result of a Bing search on "jamie and claire fraser fictional or real". Well, I'll be honest with you; my first reaction on seeing that was to burst out laughing. I mean, it's one thing to say that these characters seem like real people -- and I have said that myself, many times! -- but seriously, how could you not notice you were reading fiction?!? On the other hand....maybe Jamie, Claire, et al., are indeed real people, just living in an alternate universe where time-travel is possible? Maybe there really is a time-travel gene, and the people who mapped the human genome a few years ago just haven't figured out what its purpose is, yet. Andrew Bell really did print the first edition of the Encyclopaedia Britannica in Edinburgh between 1768 and 1771, while Jamie Fraser was in America. The Bethnal Green tube station disaster in London in 1943 (in which Roger's mother was killed) is a real historical event. It's not difficult to imagine that Roger was there, as a small child, among the survivors. 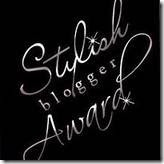 Thanks very much to Deniz Bevan at The Girdle of Melian for giving me the Stylish Blogger Award! I first got to know Deniz on the Compuserve Books and Writers Community (in fact, if I'm not mistaken, she was the one who responded to my first-ever post on the forum, back in March 2007) and I always enjoy reading her comments on the forum. Well, here are a few things about myself. 1) I enjoy doing needlepoint as a hobby (often while listening to OUTLANDER audiobooks on my iPod). My latest project is about 80% complete, and I'll post a picture when it's done. In the meantime, here's one I did last year. 2) I don't have a Kindle, Nook, iPad, or similar device. I'm starting to feel like a bit of a Luddite. <g> Maybe this will be the year I finally break down and join the e-reading craze? 3) And speaking of technological gadgets....I have no sense of direction, NONE! I can't imagine how I got along for so many years without a GPS. I've had my Garmin for a little more than a year now, and I love it. 5) I'm a graduate of the University of North Carolina at Chapel Hill, and of course that means I'm also a fan of Carolina basketball. <g> (Hoping for a better season this year than last!) Go Heels! My Outlander Purgatory - Carol blogs, Tracey tweets, and on Monday nights a bunch of us get together to chat about All Things Outlander. It's been about a year since I discovered this site, and I love it. Carol and Tracey are very entertaining, and frequently hilarious. 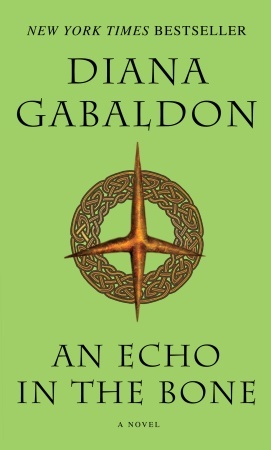 (Oh, and thoroughly addicted to Diana Gabaldon's books, of course. <g>) If you haven't yet visited the site, I highly recommend it! Blue Moon Magnolia - Bri runs a very entertaining blog, which is a pleasure to read. I still laugh every time I think about the Pumpkin Homage to THE EXILE, which was her creation. If you haven't yet checked out this site, you really should. I think you'll like it. Please forward this link to anyone else who might be interested. By the way, I asked about audiobooks and was assured that the unabridged audiobooks do indeed count toward this challenge! I'm not affiliated with the above site in any way at all, just happened to stumble across this tonight and thought some of you might be interested. <g> Good luck! If you have questions about this challenge, or issues with the site itself, you can contact TheLitBitch at thelitbitch@me.com. Please note, you don't have to have a blog to sign up for this challenge! Just send her an email and she'll get you signed up. UPDATE 1/21/2011 6:45 am: If you're having trouble copying the "OUTLANDER Challenge 2011" badge from TheLitBitch's site, here is the code I used to put the badge on my blog. I've been watching the PBS series "Downton Abbey" recently (great show, btw, sort of like "Upstairs Downstairs", wonderfully written and acted), and I think I've found a new candidate to play Lord John. One of the characters in "Downton Abbey" is a young man named Matthew Crawley, played by Dan Stevens. IMDB says Dan Stevens was born in 1982, which makes him exactly the age that Lord John is in BOTB. He may be a little too tall for Lord John's 5'6", but otherwise I think he fits my mental image pretty well. And his voice is very much like what I think Lord John sounds like, too. Here are some more pictures. What do you think? The one shown above is my favorite. If any of you have seen "Downton Abbey", I would be interested to know what you think about it. I'm really enjoying it so far! 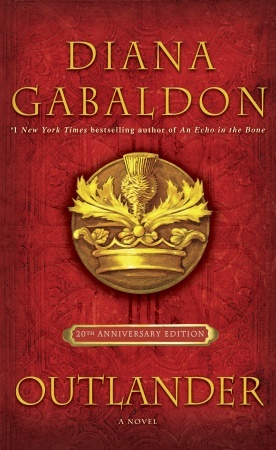 UPDATE 2/15/2012 7:00 pm: Check out my blog post comparing "Downton Abbey" and OUTLANDER. 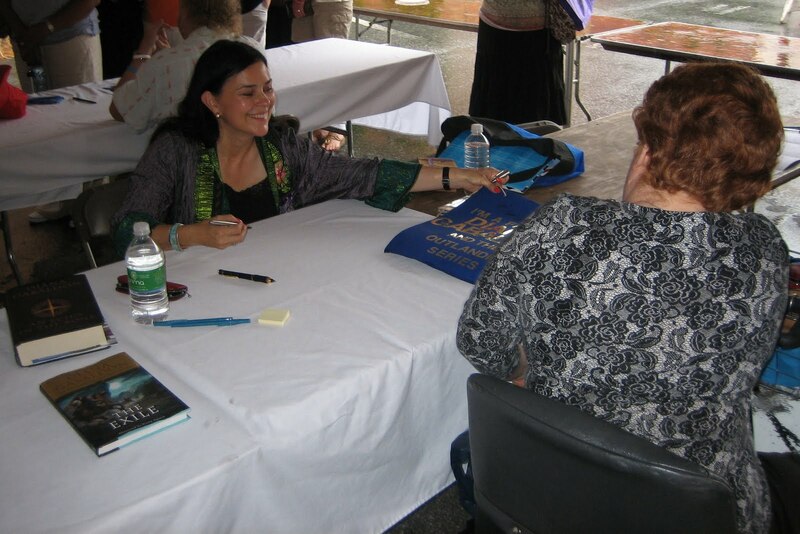 Diana Gabaldon's new web site was unveiled yesterday, and I really couldn't be happier with the results! It looks beautiful. The site is well laid out, visually appealing, and easy to navigate. I like the fonts and colors. (I like the little DG "monogram" that shows up when it's in a tab, too. Very nice. <g>) The focus is back where it should be -- on Diana, her books, and topics of interest to readers and fans. That's a vast, vast improvement over the old site! The best part, for me personally, was discovering my picture at the top of the Links page! As if that wasn't enough....it gets better. <g> Here's what Diana had to say about that picture. 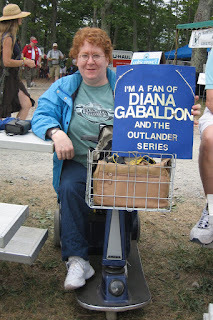 The photo above is of Karen Henry, the irreplaceable "Czarina of Traffic," who manages all of the threads, topics, and general chaos in the Diana Gabaldon folder. This photo was taken at a Highland Games, where she was meeting a number of other Forumites who didn't know each other by sight. My homemade sign was extremely effective at the Highland Games, and Diana was kind enough to autograph it for me when I saw her in September in Winston-Salem, NC. Every once in a while, people ask me if Diana reads my blog. My usual response is, "I have no idea, but she certainly knows it exists." Well, yesterday I got the answer to that question. I was thrilled to see that Diana mentioned Outlandish Observations on the Links page, calling it "a beautifully done, entertaining blog". Wow. Thank you so much, Diana! That means a lot to me. Finally, I was glad to see that the new web site prominently features a link to the Compuserve Books and Writers Community. 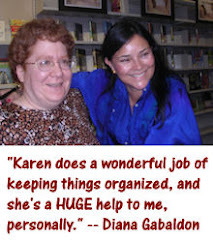 For those of you who don't know, that's the online community where Diana hangs out, and I am Section Leader of the Diana Gabaldon folder there. If you have a question or a comment about anything relating to the books, feel free to post on Compuserve. We're always happy to see new people on the forum, and Diana likes to hear from her readers. Congratulations to Diana on the launch of the new web site! It looks terrific, and I'm having a lot of fun exploring it. I would really encourage the rest of you to do the same. UPDATE 1/12/2011 11:45 am: Diana did indeed see this blog post, at least. Her response to me on Twitter was "Thanks, Karen! That's great--much appreciated! <g>"
Today, January 11, is Diana Gabaldon's birthday. She's 59 years old today. I hope she has a wonderful day! If you're not on Twitter, or you want to leave a longer message, there is a "Happy Birthday Diana!" thread on Compuserve here. As an OUTLANDER fan, I can't help but be fascinated by the many ancient stone circles found throughout the world. Before I read Diana Gabaldon's books, I'd heard of Stonehenge, of course, but I had no idea that there were so many other formations of standing stones throughout the UK and elsewhere. I have never had the opportunity to see any of these places in person. (Still hoping to go to Scotland some day!) 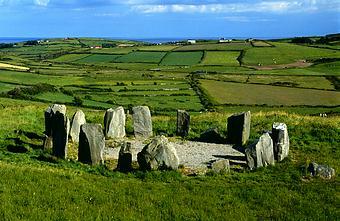 If any of you have seen a stone circle, feel free to post here and tell us what it was like. 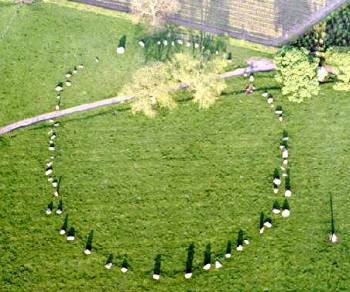 Here are some pictures and links I've collected about stone circles around the world. Hope you enjoy them! Here's a recent episode of the PBS program "Nova", called "Secrets of Stonehenge", which explores one theory about the origins and construction of Stonehenge. It's almost an hour long, but pretty interesting, especially when they try to recreate how the ancient builders of Stonehenge managed to move those huge stones over long distances. Callanish, Isle of Lewis, Scotland. The logo for my blog shows another view of the Callanish stones. I think they're beautiful, in an eerie and mysterious sort of way. <g> And the closest thing I've ever seen to what I imagine Craigh na Dun might look like. This picture reminds me of Claire's reaction when she visits Corrimony Cairn, where General Simon Fraser will be buried. No buzzing, no screaming, no sensation at all. It was just a rock. After all, I thought, there was no reason why all standing stones should be assumed to mark time portals. Presumably the ancient builders had used stones to mark any place of significance— and surely a cairn like this one must have been significant. I wondered what sort of man--or woman, perhaps?--had lain here, leaving no more than an echo of their bones, so much more fragile than the enduring rocks that sheltered them. 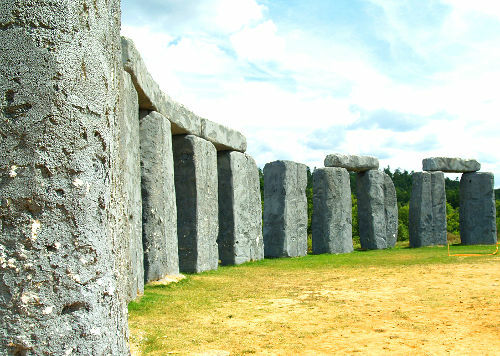 This collection of Wild and Wacky Stonehenge Replicas is good for a laugh. I like "Foamhenge" (pictured below) the best. Here is an interactive map showing the location of all the various stone circles and similar formations throught the UK. You can zoom in to see the exact location, as well as pictures of the standing stones. Diana says it takes 2-3 years to write one of the "big books". (Why does it take so long? Look here for the explanation in Diana's own words.) She only started working on Book Eight in 2010, so it will be a while. We might see Book Eight in 2012 or 2013, but we are only guessing! Keep watching Diana's blog and web site for further updates. And if I find out anything more specific, I will certainly post it here. 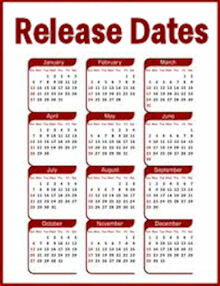 Basically, book-publishing dates are chosen by some secret process that defies rationality. <g> I think they do it by sacrificing pigeons in Times Square and reading the entrails, myself. Again, keep watching Diana's blog and web site for further updates. I'll post here as soon as I have any more specific information. 3) "Lord John and the Plague of Zombies"
This novella was completed in 2010, but we still have no information on a possible release date. The name of the anthology is DOWN THESE STRANGE STREETS, and it's edited by George R. R. Martin and Gardner Dozois, the same people who brought us WARRIORS and SONGS OF LOVE AND DEATH. I will post here as soon as the release date for DOWN THESE STRANGE STREETS is announced. 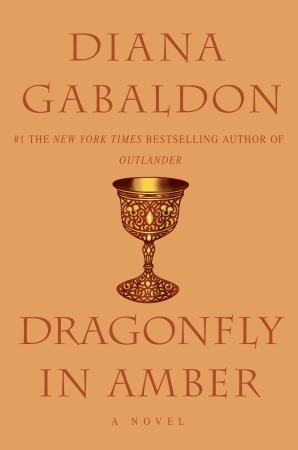 Amazon.com is now showing the unabridged audio version of WARRIORS (the anthology containing Diana Gabaldon's Lord John story, "The Custom of the Army") as being available for pre-order, with a release date of March 29, 2011. It appears that the mass-market paperback edition of WARRIORS will be split into three volumes. From what I can tell, it seems that WARRIORS 3, due out in August 2011, will be the one that contains "The Custom of the Army", but I have not yet been able to confirm that. I'll post here with more information as soon as it becomes available. We have very little information about the OC II, other than the fact that Diana has been collecting a lot of things to put in it. <g> Last I heard, she was still hoping this book would be released in 2011, but we are really only guessing. If I find out anything more specific, I'll post it here. 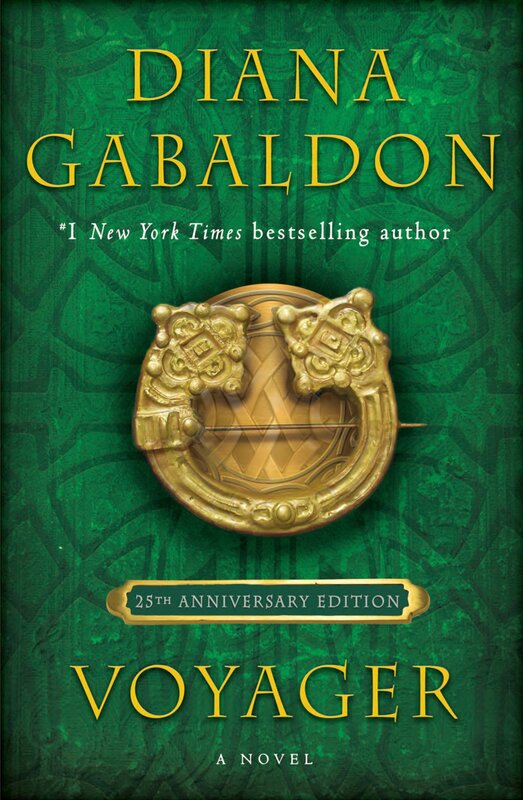 This is a special hardcover edition of OUTLANDER, to be published July 5, 2011. Look here for the details. The mass-market (small size) paperback edition of AN ECHO IN THE BONE will be published on May 24, 2011. Look here for the details.